I wonder what this piece of lace could have been used for. 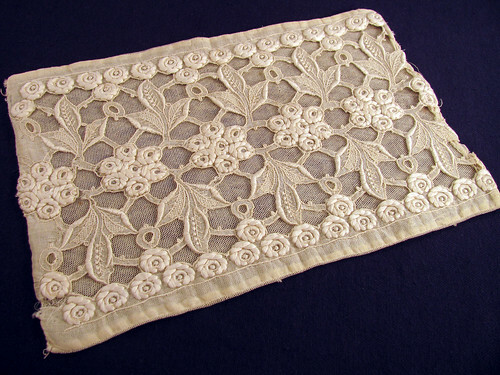 It is finished on all four sides in a way that suggests it once adorned a bodice. I am only blogging about it because I think the roses are embroidered in an interesting way. They are done quickly by pulling several strands of thread through at one time to make the overlapping petals. The centers are satin stitched crescents. I have to remember this technique and try a sample. This close-up photo is showing me that I really need to soak it in oxyclean. That way the brown spots won’t get any bigger. I have archival tissue to keep it nice after cleaning. Just another to-do on my ever growing list. This entry was posted on Sunday, March 15th, 2009 at 3:00 am and is filed under Lace and Vintage. Tagged: Lace, Vintage. You can feed this entry. You can leave a response, or trackback from your own site. you have the most amazing pieces of lacework!! I know I don’t always comment – but I love seeing them. 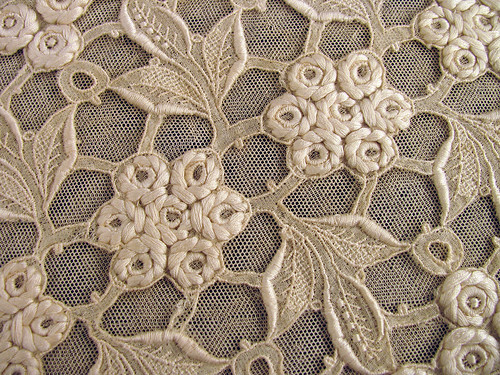 I was curious as to how you’ve acquired so much lace….where do you find it? You have an AMAZING collection!